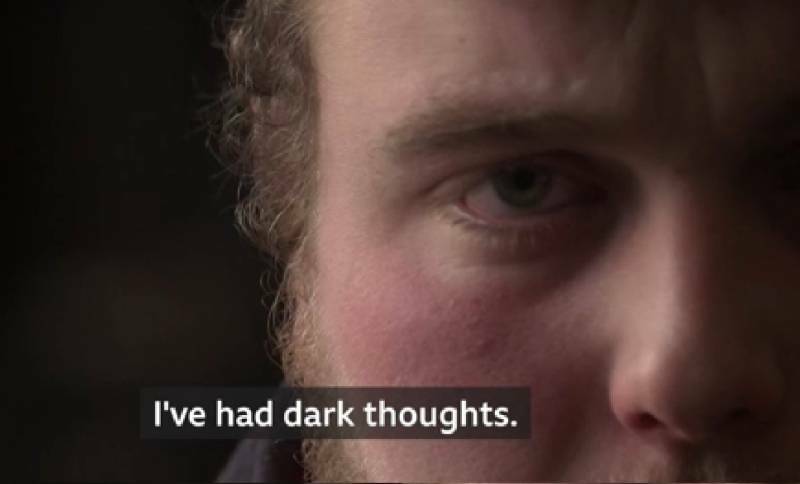 Viewers have applauded the BBC for tackling the topic of mental health in the farming industry after a short film was aired on Monday night. Poor mental health is emerging as one of the biggest, yet unspoken challenges in the British farming industry. The eight-minute long segment, which featured on BBC News at Ten on Monday night (15 April), showed farmers and their families across the UK battling mental health issues. "I nearly did something stupid... the only thing that stopped me was the thought of Jonathan"
Ayrshire dairy farmer Jonathan McCamley, 22, spoke of his battle with mental health. He told the programme that his life is currently in 'turmoil'. The young farmer spoke of financial difficulties after a milk price crash and his parents' divorce, factors which have taken a toll on his mental health. "To be truthfully honest, I think that too many people go and lift meat off the shelf or milk off the shelf and they never think about where it came from," he said. He said that people don't know what 'heartache or stress' went into making such products. Farmers on social media praised the programme. One farmer called it 'very moving', and urged everyone in the industry to watch and share as widely as possible. Very moving short film. All farmers watch and share as widely as possible. Help is available. If you’re suffering, speak up - the avenues of support are endless ?? It comes as the Health and Safety Executive (HSE) identified stress, depression and anxiety as some the main causes of work-related ill health for farmers. The overall illness rate for agricultural workers is 46% higher than the industry average, and stress, depression and anxiety are significant causes of ill health alongside musculoskeletal disorders and lung disease. But there is help available. Rural-based charities such as the Farming Community Network, the DPJ Foundation and Royal Agricultural Benevolent Institution (RABI) help farmers who are suffering from mental health issues.